Includes full body Swedish massage, Rehabilitation massage, Palliative or Geriatric massage, Puppy massage, Lymphatic Drainage massage, and Sports massage. 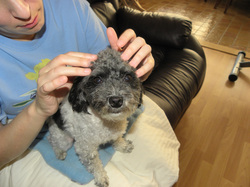 Regan performs tapotement on Alfie, a Maltipoo. Swedish massage involves light, superficial strokes including effleurage (using the palm of the hand, exerting gentler pressure as the stroke moves toward the heart) and raking (a variation of effleurage where the fingers on the hand are splayed with pressure in the fingertips), deep tissue strokes including petrissage or friction (squeezing the muscle against a bone to stretch and smooth the muscle fibres using the ball of the thumb) and kneading (picking up or lifting of the muscles), and stimulating strokes such as tapotement or vibrations (gentle tapping like playing a piano), hacking (a chopping motion used on large muscles), and cupping (performed with hands in a cupped position, tapping over muscles). Afterward the massage is completed on each side, and the legs are gently stretched to ascertain range of motion. The purpose of Swedish massage is to relax the muscles, ease pain in tendons and ligaments, create a sense of comfort and well-being, increase muscle tone, improve elasticity and circulation, and rejuvenate the nervous system. In the case of a massage for the purpose of relaxation, the major role the Swedish massage plays is in the reduction of stress and tension. A relaxing massage provides a sense of calm and balance for dogs that are under stress. It can increase the level of trust between the dog and humans (especially for dogs that have been abused or neglected). Dogs with behavioral or training issues will benefit from the emotional calming massage will produce and a state of mind more conducive to learning. Scarlett, a Border Collie mix with cruciate issues. A rehabilitative massage program must be approved by your veterinarian. Massage can assist and shorten healing time for soft tissue injuries (post-injury and post-surgery). Strains, sprains, torn tendons or ligaments or muscles, chronic lameness, or trauma rehabilitation can all benefit from massage therapy. In the case of fractures, massage can provide supportive therapy for an physical compensation that may occur. Tubby is an adorable senior Morkie! Aging dogs benefit from increased circulation, which is where massage can help. Geriatric issues that may be improved by massage therapy include arthritis, decreased nerve activity, diminished mental function/depression, circulatory problems, muscle atrophy, and more. Other benefits include the improvement of the senior dog's coat and skin, an increase in body temperature, warming the muscles, greater range of motion and greater energy and a feeling of rejuvenation. Massage can help puppies develop emotionally, socially and physically (particularly with respect to flexibility, which is important for young, growing animals). Large breed puppies benefit from massage physically as they cope with rapid growth rate. Massage will allow stretched muscles to relax and the release of endorphins will help reduce pain associated with growing. Stella 20 days after being spayed. Lymphatic drainage massage is focused on the moving and draining of the lymph from the extremities into the nodes for processing and eliminating toxins and waste materials. Dogs recovering from an illness or surgery, who have experienced chemical overloading of their systems (from prescription drugs or a fatty diet or processed foods), those suffering from disease processes or have compromised circulation systems will all benefit from this type of massage, which is usually done in a series of three sessions over 7-9 days. Shelby, a Great Dane, gets her second sports massage! This is a stimulating massage, meant to shorten the time an animal needs to spend warming up prior to entering competition while also ensuring the dog is warmed up for an optimal range of motion for the sporting activity, ensuring a quality performance with reduction in risk of injury.